Last Friday 8th of August, six students from Mackay attended the annual ABSCH Senior Drama Event 2014, held at Santiago College in Lo Barnechea. The group of students, selected by their acting skills, was formed by Vicente González (7°A), Alejandro Larraín (7°C), Mathias Lindhorst (8°C), Juan Cristóbal Manríquez (IMC), Martín Ljubetic (IIMA) and Agustín Bianchetti (IIMA). 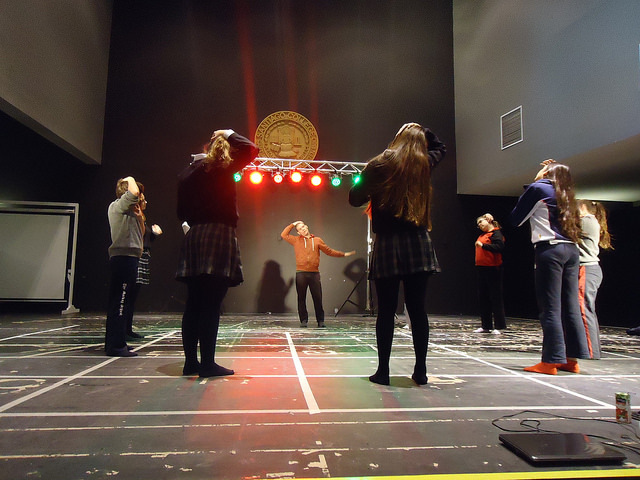 Prior to the activity, students were required to choose a workshop from a list of six, among which were “Improvisation”, “Costume and Makeup Design”, “Physical Theatre”, “Music”, “Puppet Design” and “Radio Theatre”. Once in Santiago, students were distributed in different locations around the school in order to learn and practice the acting techniques above described, which would later be put into practice, as part of a final performance based on an extract of the book “The Witches” by Roald Dahl. Our boys really enjoyed this activity and concluded that this experience was useful not only in terms of improving their acting skills, but also in what concerns sharing experiences and practicing more English. El pasado 8 de Agosto del presente, seis de nuestros alumnos asistieron al ABSCH Senior Drama Event 2014, organizado por el colegio Santiago College en Lo Barnechea, Santiago. El grupo de alumnos, seleccionado por sus habilidades actorales, estuvo formado por Vicente González (7°A), Alejandro Larraín (7°C), Mathias Lindhorst (8°C), Juan Cristóbal Manríquez (IMC), Martín Ljubetic (IIMA) y Agustín Bianchetti (IIMA). Ya en Santiago, los alumnos se distribuyeron en distintos lugares del colegio donde aprenderían nuevas técnicas de actuación, que pudieron poner en práctica en la ceremonia de clausura del evento, tras preparar un extracto del libro “Las Brujas” de Roald Dahl. Nuestros alumnos disfrutaron mucho esta actividad y concluyeron que esta experiencia no tan solo fue útil para aprender más acerca de técnicas de actuación, sino que también en lo referente a compartir experiencias y practicar su Inglés.